② Who Needs A Runway?! Take Off From Where You Are!!! · Infuse passion in your life professionally and personally! · Create a culture that values and respects all team members: One Mission, One Goal, One Team! 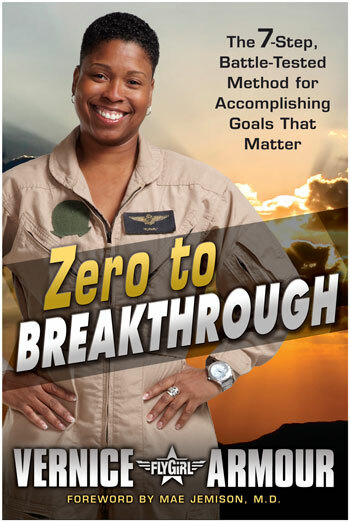 ④ Zero To Breakthrough: A Breakthrough Mentality Creates A Breakthrough Life! · How to ignite your spark and make YOUR dreams a reality! Describing her warp-speed success as "Zero to Breakthrough," Vernice "FlyGirl" Armour is a model of passion, focus and commitment. Propelling herself from beat cop to combat pilot in a record-breaking three years, she became the U.S. Marine Corps’ first African American female pilot and, shortly after, was recognized as America’s first African American female combat pilot by the Department of Defense. A popular, engaging and energetic motivational speaker, Armour shares her philosophy and process to help leaders and organizations adopt a “breakthrough mentality.” Outlining a variety of fundamentals, including emphasizing the difference between reacting and responding to situations, she provides insight and examples of how acknowledging obstacles can lead to achievement and success. 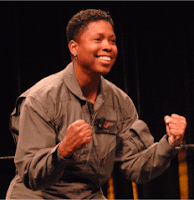 Armour delivers her concept on a variety of platforms, including keynote presentations, consulting seminars and media appearances, having been featured on CNN, NPR and The Oprah Winfrey Show.